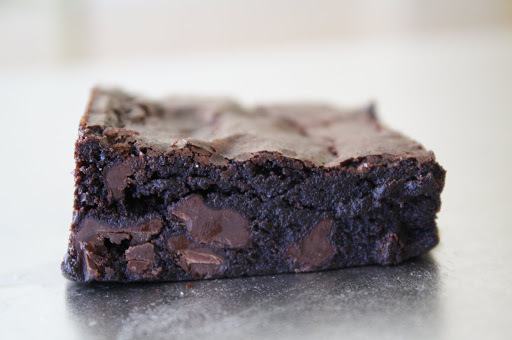 A trio of brownies courtesy of Sweets for the Soul bakeshop in Atwater Village. 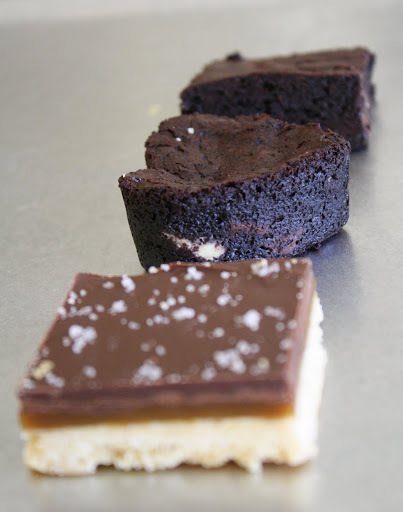 From nearest to farthest: the Billionaire’s Bliss brownie, the Obama brownie, and the Espresso brownie. 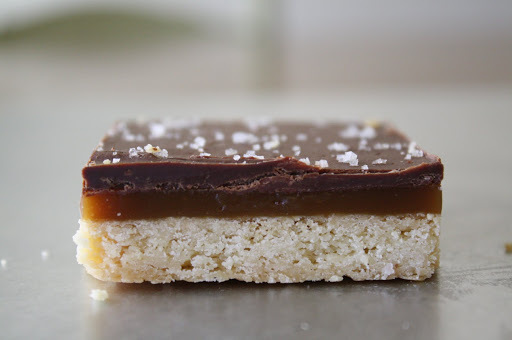 Buttery shortbread and homemade caramel topped with dark guittard chocolate and fluer de seul. Fragrant ground espresso infused in a cocoa base with valrhona dark chocolate chips. Rated by the Los Angeles Magazine as the best brownies in Los Angeles, Sweets for the Soul bakery offers a delicious assortment of hand-crafted treats. Deciding which item to indulge in provides a considerable feat for any dessert-lover as each maintains the perfect balance of flavors. This heavenly bakeshop is a must for Los Angeles natives and tourists alike; I can assure that you will return for seconds. Thin, crispy Belgian waffles with fresh fruit for breakfast. 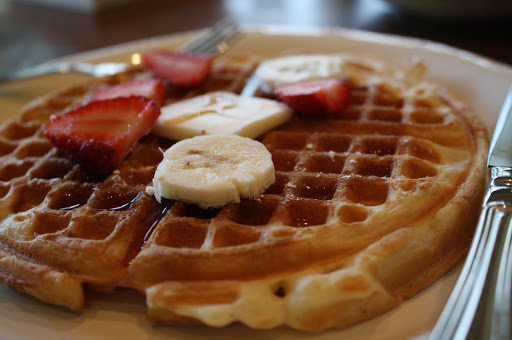 I love the contrast between the waffle’s crunchy exterior and its soft, airy interior; a delicious start to my day. 1. Preheat the oven to 350 degrees. 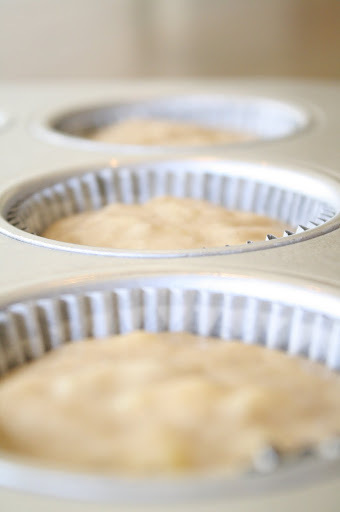 Line a 12-cup muffin pan with paper liners. 2. In a medium bowl, whisk together the flour, sugar, baking powder, baking soda, salt, and cinnamon. 3. Make a small well in the center of the flour mixture. In the well, mix together the mashed bananas, butter, eggs, and vanilla. Stir to incorporate the entire mixture; do not over mix. 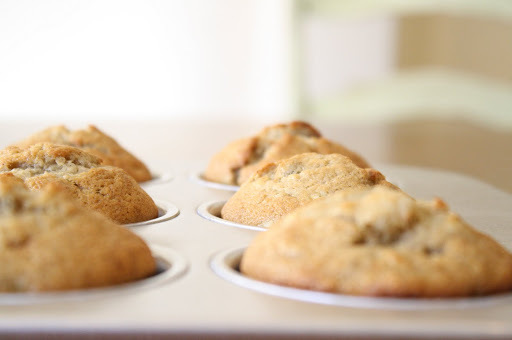 Evenly distribute the batter into the muffin cups. 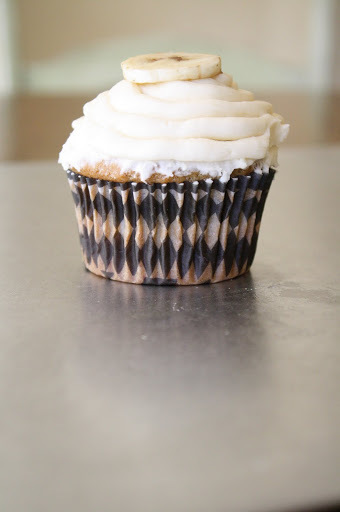 Bake until a toothpick inserted in the center of the cupcake comes out clean, for 25 to 30 minutes. Allow the cupcakes to cool completely before frosting. 4. For the frosting, in a bowl of an electric mixer fitted with a paddle attachment, beat the butter until creamy. Slowly add the confectioners’ sugar, beating to combine. 5. Add the vanilla bean seeds and vanilla extract and beat to combine. Slowly add milk and continue beating on medium-low speed until smooth and creamy, about five minutes. 6. Frost the cupcakes using a piping bag and garnish with a fresh banana slice. Moist, tender, and topped with airy vanilla bean frosting, bananas have never tasted so good. This heavenly cupcake recipe serves as a definite crowd-pleaser. 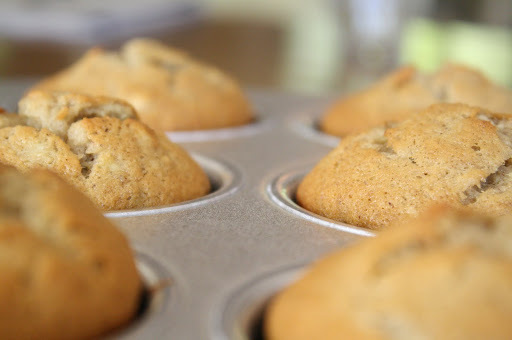 The batter provides a flavorful base for all things banana, from breads to muffins. Enjoy whichever rendition you choose! Juicy, homemade sliders for dinner. 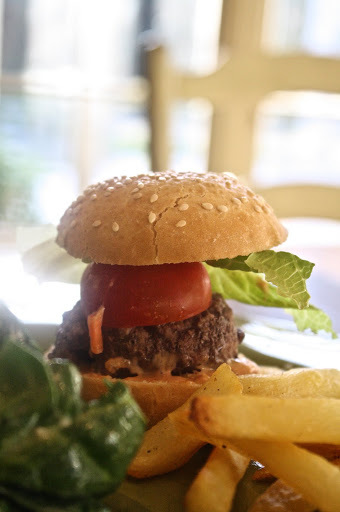 Baked, sea salt fries and spinach-goat cheese salad compliment the bite-sized burgers. 2. In an electric mixer fitted with a paddle attachment, beat together butter, sugar, salt, and vanilla on medium-high speed until smooth, about two minutes. Beat in flour gradually, beginning on low speed and increasing to medium high. 3. 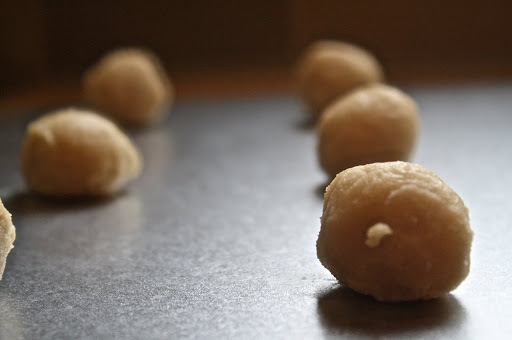 Roll dough by teaspoonfuls into balls and place on an un-greased baking sheet one inch apart. 4. Bake for 10 minutes, remove from oven, and make indentations using thumbs (if the dough is too hot to handle, use a teaspoon measure or watermelon baller for the same effect). Return to oven and bake for an additional seven to nine minutes. 5. 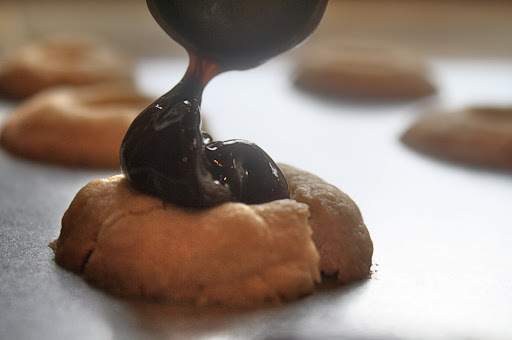 Remove the cookies from the oven and allow them to cool completely before adding the nutella filling. 6. For the filling, combine nutella and butter in a small, heat-proof bowl. Set the bowl over a pot of simmering water and stir until smooth. Add the milk and stir the mixture until completely combined. 7. Spoon the filling into the cookies using a teaspoon measure. Cool the cookies in the refrigerator for 20 minutes until the nutella filling is firm. 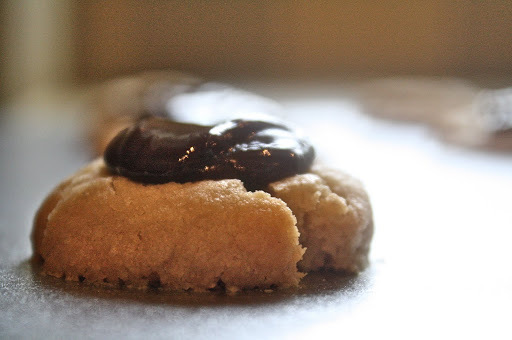 These delicious, nutella-filled thumbprint cookies spice up your standard snack break. Dip in coffee for added flavor or pop one in your mouth for sweet satisfaction. 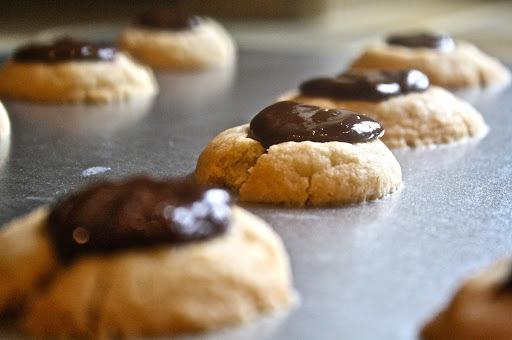 I love the contrast between the buttery crunch and silky, chocolate-hazelut filling. An easy and efficient recipe, impress your party guests with this tasty dessert. Happy baking!